Do you ever get an idea, thought, scheme, song, (whatever) stuck in your head and you just can't get it out until you do it, sing it, see it, make it (whatever)? This terribly annoying condition happens to me often. Usually the results are good, sometimes, not so much. Regardless, it feels good to get it out of your head. To know that it's been written, made, painted, sung, (whatever) allows you the freedom to move on from the idea and begin the process of creating new ones. Such is the case with this post. For days I couldn't get the rhyme out of my head - most significantly, the phrase "Curds and Whey". The nursery rhyme was not of large importance to me, my mother didn't sing it often or anything. I just couldn't get the idea of curds and whey out of my brain. I thought that surely, there could be a dish made of this singsong. And a damn good one at that. Being quite interested in the philosophy of food as well as the cooking of it, I wanted to take a communicative approach to this dish. In my opinion the most successful composed dishes are the ones in which the chef can communicate a feeling or idea to the diners, solely through the dish itself. 1. The ingredients Curds and Whey. 2. The season of early Spring. 3. An outdoor setting reminiscent of Little Miss Muffet's. 4. Surprising natural elements that spoke of a specific time and place on Long Island. I'll begin with the finished dish, and then break down the elements from their sourcing to their creation. At the time of this dish's creation, I was living in Ridge, New York. A small town right near the edge of the Long Island Pine Barrens. The barrens cover more than 100,000 acres of Long Island, and are the area's last remaining wilderness. It was here that I sought the inspiration for the dish. I knew I wanted to include pine in the dish (yes, there are edible trees out there) - I think it smells great, tastes even better, and has an uncanny ability to whisk people away to another place and time. Remember the smile that creeps across your face when you bring a fresh Christmas tree into the house? That's what I was going for. 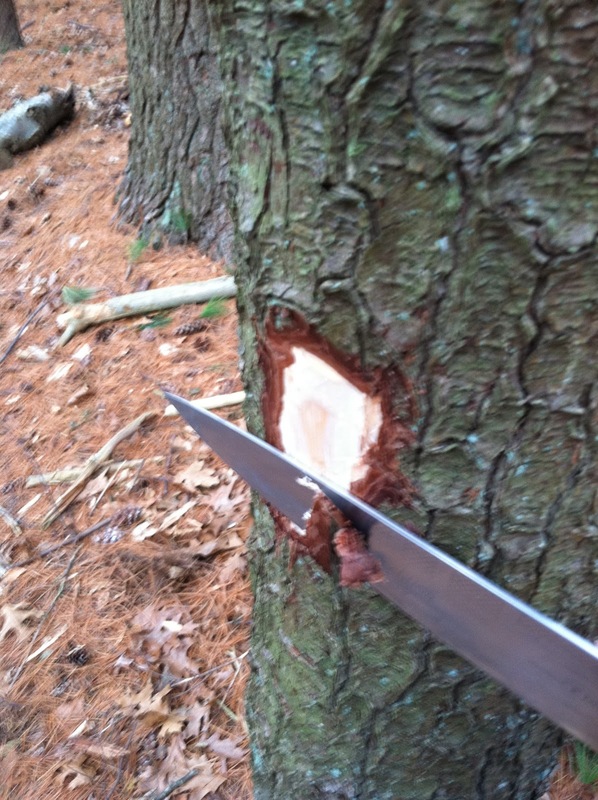 For more information on eating trees, check out this great link: Edible-pine-bark. 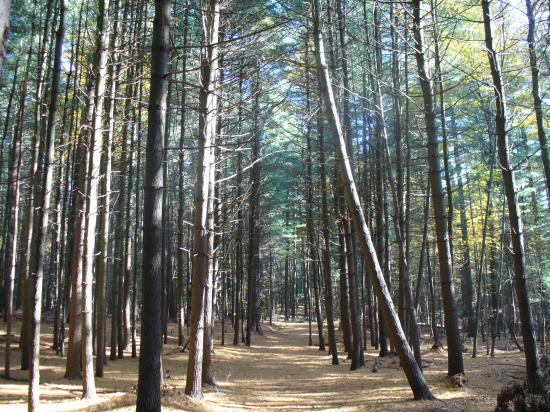 The suburb I lived in was covered in pine, but not the Eastern White Pine - sought after for it's height, aroma, and edibility. 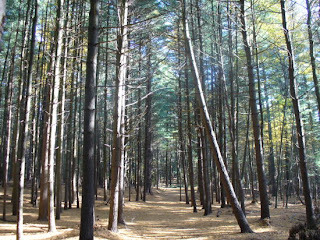 For these (with the help of a fellow forager) I traveled to Middle Island and found Prosser Pines, a preserve of White pines planted in 1812. The pines towered over me and literally created a forest cathedral above my head. I knew I wanted to bring back some of the bark, and a fair amount of the needles. The tree is easily identified as one of the only pines with clusters of five needles. The only edible part of the bark is small strip just underneath the outer bark, and above the heartwood called the "innerbark" or "phloem". This is what I was going for. I took several small slices with me, being cognizant of the fact that I did not want to permanently damage the tree. I also collected several bundles of fallen green needles and picked a few wild greens - chickweed and winter cress. Back at the kitchen, I washed everything, and separated my ingredients, knowing that I wanted to utilize everything I had collected. Pictured are the needles, inner and outer bark. Rasgulla are a sweet Indian treat made by forming separated milk curds into balls and then simmering them in a sugar syrup. See my previous post on Rasgulla. This time, instead of cooking the spheres in a simple syrup, I boiled them in a hardwood smoked maple syrup. They took on an incredible smokey, earthy complexity. I wanted the rasgulla to be slightly misshapen so that they would resemble stones found on the forest floor. After all, how often do you com across a perfect sphere during your hike? These maple soaked rasgulla would act as my Curd component on the dish. The idea of a whey sorbet just fascinates me. Sorbet, by definition, doesn't have any dairy. At its most basic form, it is a flavorful liquid (fruit juice, wine, etc...) and sugar. When the correct amount of sugar is added, and the base is frozen in an ice cream machine, it creates a smooth ice cream like texture without the added fat of dairy. It is refreshing, clean, and light. Whey, by definition, still has dairy in it. Milk proteins and sugars or lactose. But it lacks much of the fat and milk solids contained in the curd. So you can see why a whey sorbet is a bit of an enigma. Here's how it worked: I made a simple syrup (1:1 ratio of sugar to liquid) with the yogurt whey instead of water so I did not dilute the flavor of the base. I used the old "floating egg trick" to get the sugar ratio right. This is was as simple as dropping a raw egg into my whey base (it sinks) and then adding the whey/sugar syrup until it floated to the top. This procedure insured that the base would have the correct sugar ratio to make a smooth and cohesive sorbet. From there, it was a just matter of getting the base into my ice cream maker and churning it. The sorbet was beautiful and unlike anything I had ever tasted before. It had a rich underlying dairy tone to it. It fooled your tongue into thinking it was creamy - yet, it was not. It was light and refreshing. Strange, and magical... Again, I didn't want the shape of anything on this dish to seem unnatural, so instead of a scoop or quenelle, I chose to simply spoon the sorbet into a central pile on the plate - mimicking the way snow may fall in the forest. I made a batch of cow's milk yogurt (see previous post on Yogurt), adding a few extra hours to the fermentation time so that the end product would be a little tangier than usual. I then strained it, taking care to save all the precious tangy whey for the sorbet. 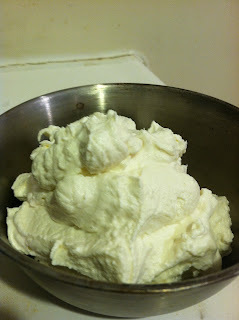 The resulting yogurt was thick and luscious. The consistency was that of a strained Greek style yogurt, but with a more acidic bite. I then loaded the soaked outer bark into a large stock pot, set the bowl of yogurt inside, and loaded the entire set-up on top of my grill (Hey, it works ok?). I put the lid on tight and let the yogurt smoke away for about three hours, stirring occasionally. The smoked yogurt was better than I could have ever imagined. Complex notes of pine, citrus, foliage, smokey wood, and forest fill your palate with just a taste of this stuff. The dish needed a crunchy component, something light and airy - I did not want this to be a filling course. I love the texture of baked meringue and realized it would be a perfect vehicle for the pine needles themselves. 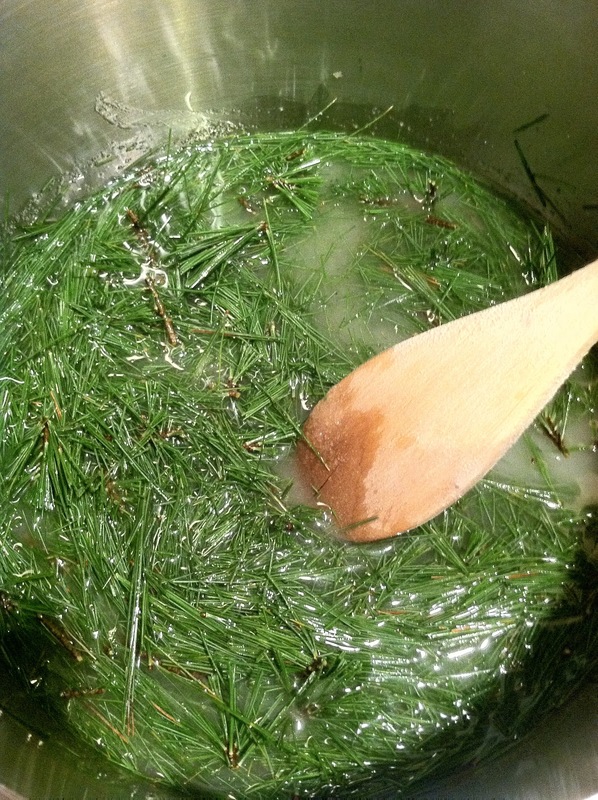 I started by steeping the washed needles in a heavy sugar syrup. 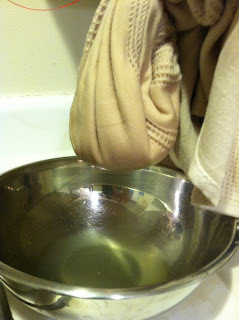 After the mixture was heated, I left it to sit and infuse for 24 hours. It was then a simple matter of blending the pine syrup and then incorporating it into an Italian style meringue. Once baked, the meringues had an initial sweet crunch and then melted away into inescapable piney bliss. The pine lingered on the tongue a moment or two filling the senses with the forest, and then faded. 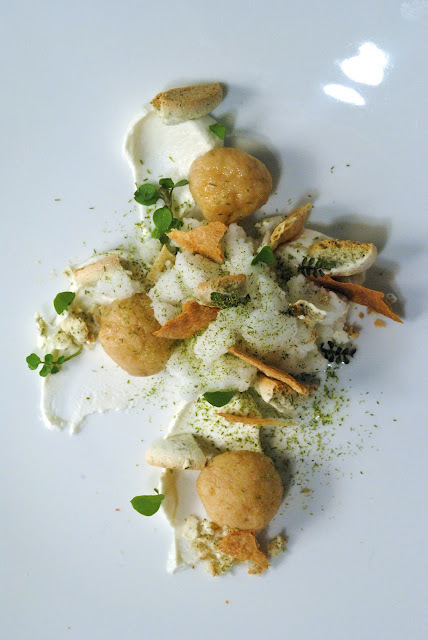 The meringues were crumbled in various spots on the plate. I knew I wanted to incorporate the delicious inner bark into the dish as well. To do this, I dried it out in the oven very slowly until it was crisp. It was then a simple matter of grinding it to a powder, and then sifting it to create a pine bark "flour". 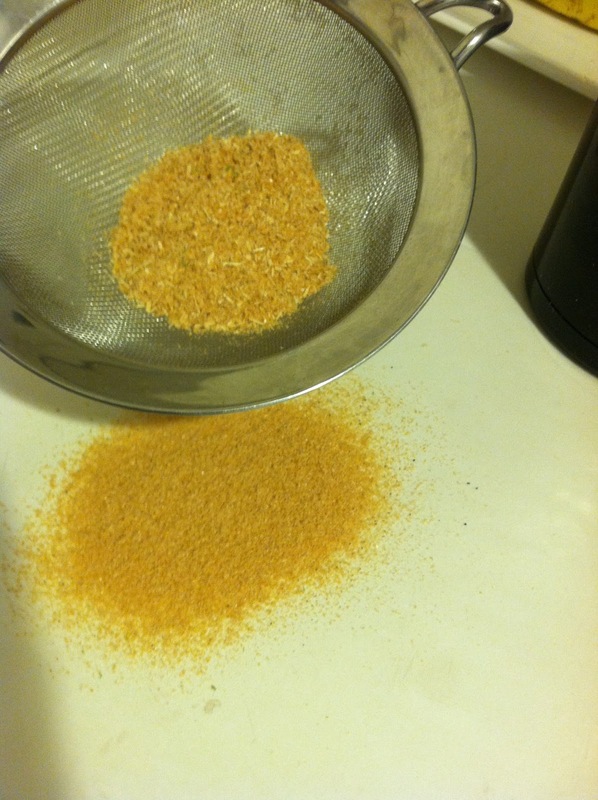 This pine flour was incorporated into a sweet cracker dough - almost a thin cookie, and baked until crisp. There are not many green things growing in January, so this task proved to be fairly difficult. Two different plants are often found in these cold conditions though and I took full advantage of their cold weather availability. I choose chickweed because it is mild and slightly sweet, and rosette cress or winter cress because it has a little bit more of a peppery kick. These greens were found near the base of the pines, so of course it makes sense to incorporate them into the dish. I washed them all and gave them a light dusting of confectioners sugar. 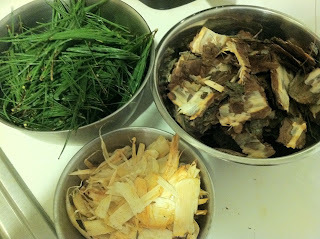 The whole dish was then dusted with a touch of toasted ground pine needle. And there you have it! Here's one more shot from above. After reviewing my list of communication factors, I'll call this one a success. Thanks Miss Muffet! Play With Your Food. Please. who ever you are - I am rapturous over your cooking and this dish. Only wish I was friends with you and could come over and eat your food. I got involved with foraging from a 70 year old female farmer (check out Wild Flavors, Chelsea Green Press) but it seems you have taken it a few steps into the unknown - making pine tree flour for instance. Congrats!